Diesel Living is exclusively premiering its new floor and wall coverings at Milan Design Week. The collection was developed in partnership with Iris Ceramica, leading Italian manufacturer of high-tech glazed ceramic and porcelain tiles. 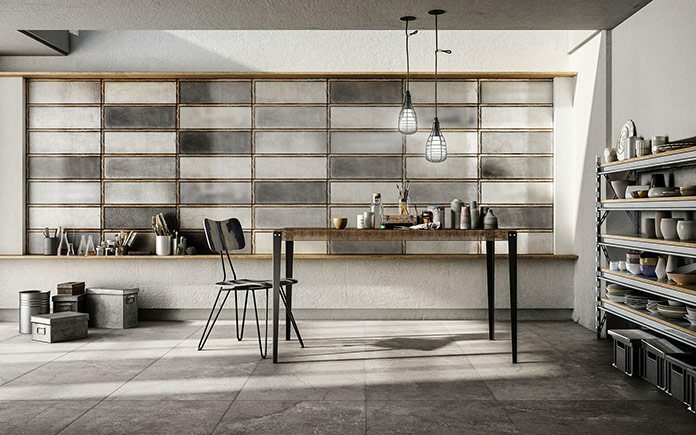 Diesel Living is continuing its unstoppable growth and on the heels of its significant successes in a number of different furnishing areas, it has now expanded its product range, selecting Iris Ceramica as its new partner for 2016. 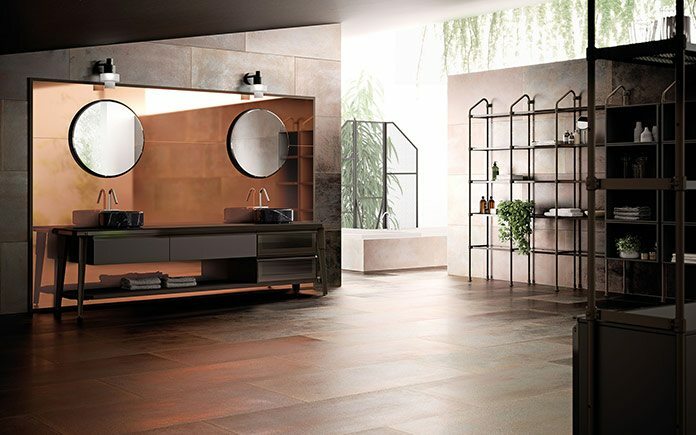 Diesel Living with Iris Ceramica: a partnership that brings together the creativity and unmistakeable taste of the international lifestyle brand and the expertise and high-end technology that made the Modena-based ceramics manufacturer stand out from its early days. 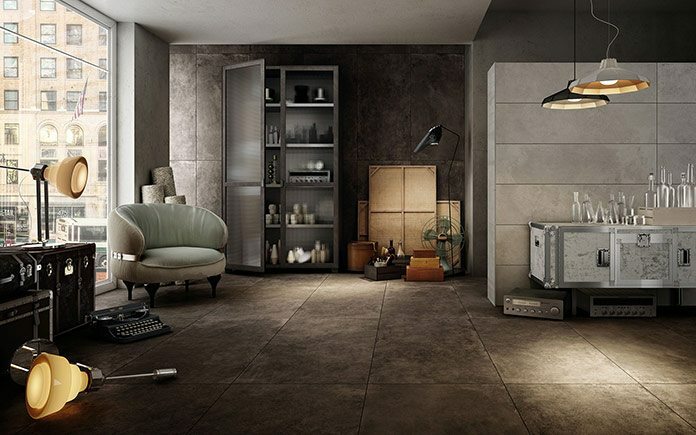 The product design is by Diesel Style Office, and the Iris Ceramica research and development department put its know-how and skills into developing and manufacturing the final product. The bespoke project expands the home decor offer and links the living zone with the bedroom area, at the same time ensuring consistency with the Diesel Living style. Inspired by industrial design and a metropolitan feel, the five collections interpret urban style through the hard rock soul of Diesel: metal tones, iridescent colours and rough resin and concrete textures decorate the rooms of the house to reveal the edgy personality of its occupants. Concrete, Industrial Glass, Camp, Stage and Hard Leather: these lines have been designed for the floor and wall coverings, to explore five different moods, paired with fabrics like canvas and jute and with “aged” finishes referencing industrial design and the vintage feel. to constantly innovate, becoming a global leader over time. The Veneto-based brand’s trendsetting spirit teamed with our technical know-how in product prototyping and manufacturing successfully combine to deliver alternative, stand-out solutions to the world of interior design”. The Diesel Living with Iris Ceramica collections are part of the Diesel Living project, now involving Iris Ceramica alongside other leaders in their respective sectors – Moroso for furniture, Foscarini for lighting, Scavolini for kitchens and bathrooms, Berti for wood floors and Seletti for home accessories.